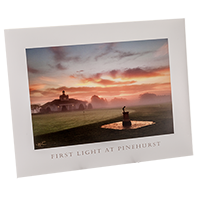 An archival fine art print of Pinehurst at First Light. This breath taking image was captured by Pinehurst Employee Partner, Kaye Pierson, as she mowed the practice greens at Pinehurst Country Club. 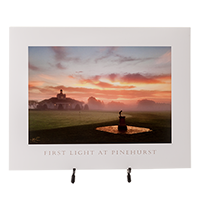 This infamous photo was highlighted by the Golf Channel and is considered to be one of our most beautiful views. From Mary Burgland of Ga,esburg, Illinois on 3/9/2019 . I purchased this print for our Greens Superintendent at Soangetaha Country Club in Galesburg, IL. 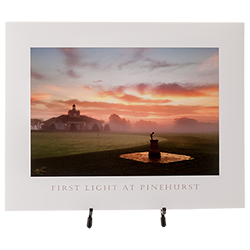 Upon receiving this print, Josh remarked, “And this is just what we get to see as the sun is rising on any golf course.....the fact that this was taken at Pinehurst makes it extra special.” Thanks to Kaye Pierson for her gorgeous print.